I’ve been out of game ideas for the past months, actually busy with other works & all. I am a big fan of NinjaDoodle Games like Click Play, Binga series, and i happen to stumble upon his yet another game PixaFixa. It has this Color mechanics & memorizing the picture & recreating it kind of gameplay. 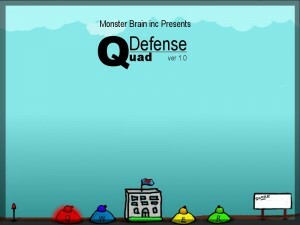 Somehow i like the idea of color change, and i combined in with a shooter game mechanics to Create what i call ‘QDefense’ (initially called as QuaDefense, but it felt annoying after a while). Playtesting was the interesting Part this time ( actually every previous time too). I think they will have the difficulty to somehow finish the game, that some will surely make it the end as i did. Well, when they started playing, no one finished it and quite shockingly they don’t even shoot down a single enemy. They never understand what the game mechanics and quickly skipped the instructions in tutorial. So what next ? I redesigned the entire stuff. Next story Quite simply, How Complex is Simple !